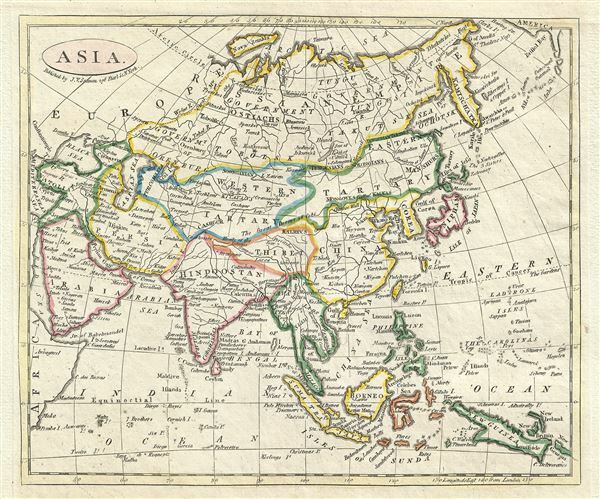 This is a beautiful example of the 1821 map of Asia published by James V. Seaman. It covers the entire continent from the Mediterranean Sea and Arabia eastward as far as Bristol Bay and New Guinea. The map centers on the vast stretch of land between the Sea of Korea and Kamchatka and the Caspian Sea, known for most of the 18th century as Tartary. This area was once part of the vast Mongol Empire consolidated under Genghis Khan around 1206 AD. Although the empire of the Great Khan had long since disintegrated into constituent states by the time this map was made, this little known and largely inaccessible region held a special fascination for western Europeans who were reared on legends of the dreaded Mongols or Tartars and their leader, the terrifying Scourge of God. Consequently, much of the geography of Central Asia represented here references these early conquests. The sea between Japan and Korea is here identified in favor of Korea. Historically, Korea has used the term 'East Sea' since 59 B.C., and many books published before the Japanese annexed Korea make references to the 'East Sea' or 'Sea of Korea.' Over time, neighboring and western countries have identified Korea's East Sea using various different terms. The St. Petersburg Academy of Sciences referred to the East Sea as 'Koreiskoe Mope' or 'Sea of Korea' in their 1745 map of Asia. Other seventeenth and 18th century Russian maps alternate between 'Sea of Korea' and 'Eastern Ocean.' The 18th century Russian and French explorers Adam Johan von Krusenstern and La Perouse called it the 'Sea of Japan,' a term that became popular worldwide. Nonetheless, the last official map published by the Russians name the East Sea the 'Sea of Korea.' The name is currently still a matter of historical and political dispute between the countries. The silk route trading centers of Samarkand (Samanrcand) and Kashgar (Cashgar) are noted. The Great Wall of China is identified as the 'Chinese Wall.' Tibet (identified as Thibet) in this map is shown independent of China – an interesting decision at the time. Japan itself is only roughly mapped according to archaic convention orienting the main island on an east-west rather than north south axis. Hokkaido, here called the Isle of Yeso, is not attached to Japan but is rather joined to Eastern Tartary or Mongolia. During the early 19th century, Asia was coming under increasingly imperialistic European sway. In India, full British rule allowed England to attain naval and trade supremacy throughout the eastern hemisphere. Using India as a springboard, the English traded wool and Indian cotton for Chinese tea and textile. By the 1830's oversaturation of the Chinese market would slacken Chinese demand for most British products and opium would become the most profitable and important crop in world markets, pouring into China faster than tea poured into Britain. Opium addiction and its attendant social ills would reach catastrophic levels and the Chinese government's efforts to end the Opium trade would eventually lead to the First Opium War of 1839-1842. This map was published in 1821 as part of J. V. Seaman's New General Atlas. Seaman, J. V., A New General Atlas, 1821.